"In the midst of total uncertainty, we can love." Thanks to WHISKEY RIVER for guiding me to Terrance Keenan's book. 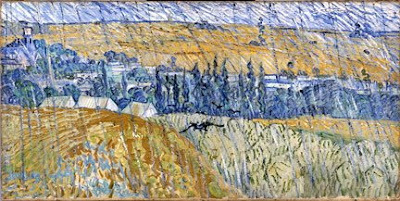 A friend directed my attention to Van Gogh's "Rain--Auvers," one of his last paintings. Looking at it made me think of R who was an 芸術家 who made a living as a 大工 and, I am certain, felt a kinship with van Gogh as he painted his last paintings at the VA hospital where he died last April. "In the midst of total uncertainty, we can paint." Sorry about the deletion - my thoughts were a mess! But I was just thinking something like: perhaps we could go further and say: DESPITE or even BECAUSE OF total uncertainty, we can... paint/love/live etc. Good thought, solitary walker. Thanks so much for picking up the idea and taking it further. oh, thanks for the intro to Whiskey River. Love it.